Black eyeliner and black lipstick for spring. Do we have your attention yet? At Rachel Antonoff, the makeup might sound scary, but it's actually quite beautiful. But, before you run to your nearest beauty counter for a black lipstick, let us be more specific. Keri Blair and her MAC team took the designer's "naughty country club girl" inspiration and created a look everyone can wear. On the eyes - a chunky eye liner (wider on the end and tapered into the inner corner) and mascara on top lashes, but what really made the look was the black lipstick applied as a stain. "We sheered out the lipstick in Black Track and I added a bit of MAC Lipmix with a bit of lip balm," said Keri. "And when you do that, it gives it this sort of stained affect." Over in hair, Jenny Balding for Cutler/Redken kept it sleek and straight with a little bit of edge. "There are a lot of geometric prints going on in the collection so I wanted the hair to reflect that with clean lines," said Jenny. To tough it up a bit, she parted the hair and made one side really tight to make it look like an undercut. 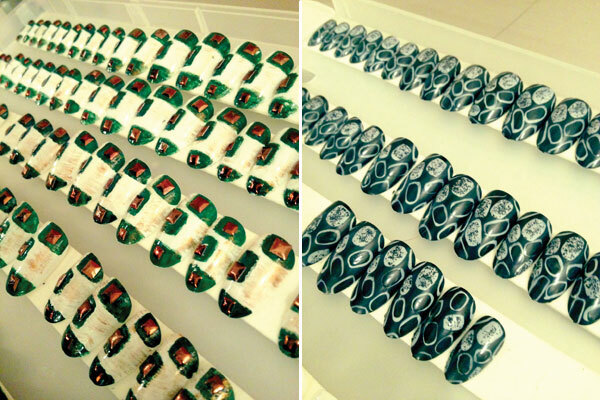 CND's Candice Manacchio and her team spent 65 hours creating the fabulous nail tips (600 to be exact). There were three different designs: black and white geographic, green and white with bronze hardware, and white with clear tips and names written in blue and red sharpie. 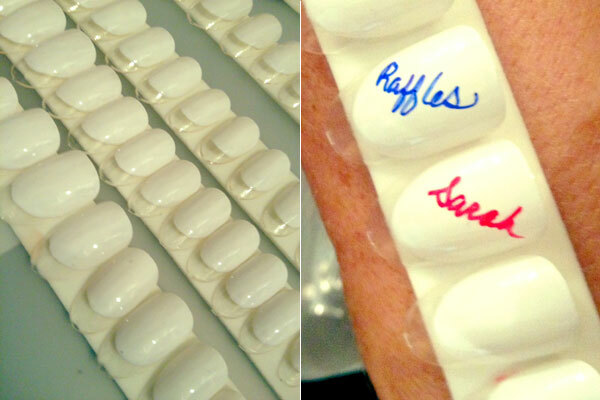 "Rachel [Antonoff] provided us with names of her team, family and friends to write on the white nails," said Candice. All three designs were inspired by a fun garden party and the 1977 video clip, "Power of Ten." We've noticed some hardware being glued onto nails this season, it's a cool alternative to nail stickers. 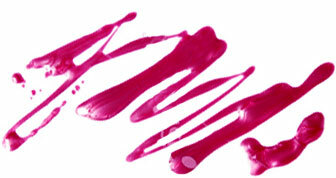 "Last season was all about fabrics on nails," said Candice. "This season is about hardware. It's not just rhinestones anymore." She recommends going to a craft store (the jewelry making section) or finding some old jewelry at home and breaking it up. "I do that a lot," she added. "Nails are an accessory!"